If you are on a budget but prefers to stay by the strip, this hotel is the best value for your money. The Quad Resort and Casino is a first-class resort centrally located in the heart of the fabulous Las Vegas Strip. It is just minutes away from McCarran International Airport and easily accessed from all major highways. Everything you need for a complete vacation is available right here and anything else is nearby because of its excellent location. Caesars Entertainment has renamed this resort, formerly known as the Imperial Palace, into The Quad Resort and Casino as part of a major brand renovation in September 2012. Both the exterior and interior will undergo major renovations that are scheduled to complete by the end of 2013. These include adding 15,000 square feet to the casino floor that will replace the space occupied by the former Imperial Palace porte cochere, a nightclub, and a gift shop. It also will renovate another 20,000 square feet of the existing casino which will be completed by the spring of 2013. The second phase of the project will add another 30,000 square feet of gaming space, including a centralized promenade bar. This phase is scheduled for completion in late 2013.The exterior facade, front desk and bell desk, hotel lobby, retail promenade, and dining levels are also are getting overhauled including the building logo. The Quad Resort’s main entrance will be moved from the Strip to the north side of the building. A pedestrian walkway will connect to the adjacent Harrah’s Carnaval Court to the south side of The Quad Resort, then into The LINQ. The LINQ is Caesars’ $550 million retail, dining, and entertainment district slated for opening late 2013. The resort, including attractions such as Frank Marino’s Divas Las Vegas, The Auto Collections, and the Hash House A Go Go, will remain open throughout the construction period. The current Imperial Palace Las Vegas has 2,640 room hotel and a 75,000 sq ft casino, with restaurants and other amenities on-site. The hotel and casino were owned by Imperial Palace LLC until purchased by the current owner, Harrah's Imperial Palace Corporation a subsidiary of Harrah's Entertainment. From 1959 to 1979 the Imperial Palace Las Vegas was called the Flamingo Capri. In 1979, it was renamed to the Asian-themed Imperial Palace by new owner Ralph Engelstad. When Engelstad died in 2002, the casino ownership transferred to the Ralph Engelstad and Betty Engelstad Trust. The casino operated as its own limited partnership, Imperial Palace LLC, under the Trust's oversight. The property underwent a major renovation in 1988 which added an 18-story tower, and eventually was purchased by Harrah's in 2005. 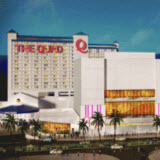 The latest incarnation is its transformation into the Quad Resort and Casino which is scheduled to complete by the end of 2013. The Imperial Palace offers six specialty restaurants featuring a variety of tasty delights, all at moderate prices, ranging from a quick bite at the Burger Palace to the fine dining, intimate atmosphere of Embers, one of the top steakhouses in Las Vegas. Voted one of Las Vegas' Top Five Most Romantic Restaurants. Classic culinary excellence served in an intimate atmosphere. Featuring succulent steaks and chops, including surf and turf, along with tableside salad and dessert preparation. Prices vary but you can have the $25 option where you can eat all day long for this one price. Hours: Brunch 7 a.m. - 2 p.m.
Dinner 4 p.m. - 9 p.m.
Make sure that your passport is up to date, as one of the most exotic tastes of the Far East can be found right here at the center of the fun, as Imperial Palace welcomes Ginseng 3, one of Las Vegas’ most notable traditional Korean restaurants. The restaurant, located on Imperial Palace’s fifth-floor dining plaza, features traditional Korean cuisine with a concept similar to owner In Chun Lee’s other Las Vegas restaurants, including the acclaimed DJK. Best of all, this restaurant is open 24/7, so you can take a trip to the exotic anytime. Home of the half-pound burger! Voted This Week's Best by AOL City Guide: Las Vegas. Burgers, fries, soft drinks and other tasty treats for the fast-food appetite. Features ice cream, shakes, malts and sundaes, as well as sandwiches, soup, breakfast bakery delights and specialty coffees. High-speed wireless Internet access is available for a nominal fee so you can bring your laptop or use one of the Internet stations. The Auto Collections is the world's largest classic car showroom with more than $100 million worth of inventory on display and for sale. More than 250 antique, classic, muscle and historically significant cars are on display and nearly all are for sale. Legends In Concert, a full-production musical spectacular of celebrity impersonators, is one of the longest running shows in the Las Vegas area and originated at the Imperial Palace. It moved next door to Harrah's in March 2009. Guests at the Quad Resort enjoy preferred access to two of the nation’s most beautiful courses, Cascata and Rio Secco, as well as premier golf instruction at the Butch Harmon School of Golf. This par-72 course, ranked one of the top 100 modern courses in America and the #2 course in Nevada by Golfweek magazine, provides stunning vistas at every turn, including the 3,600-foot peak at Red Mountain, 418-foot waterfall, lush fairways, lakes, and streams. Named the #1 public course in Nevada by Las Vegas PGA, Rio Secco is set among the rolling foothills of the Black Mountain range, combining stunning scenery and challenging play just 12 minutes south of the Las Vegas Strip. Located just two miles from The Strip, Las Vegas National is a perfect place if you want a fun and affordable course and you don’t have time to travel. This traditional Bert Stamps design is friendly to golfers of all skills levels, but also hosted the Las Vegas Invitational in 1996 when Tiger Woods won his first professional event. Located at Rio Secco Golf Course, this world-renowned school is where Tiger Woods honed his playing skills. Training facilities include indoor and outdoor practice areas along with a 90 yard short game hole, along with state-of-the-art computer and video equipment that helps instructors analyze your unique swing. For more choices in hotels by the strip, visit lasvegashotelsonthestrip.info .